1999 was a good year for the East Coast Fish-Watch Project. Our membership has now gone over 150. And our fish survey work produced 17 new records of fish species not previously known from South Africa. 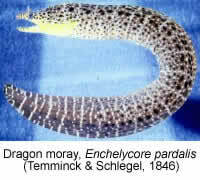 Dragon moray, Enchelycore pardalis (Temminck & Schlegel, 1846). Scottburgh (juvenile); this colourful moray was previously known from the Comores and western Pacific. 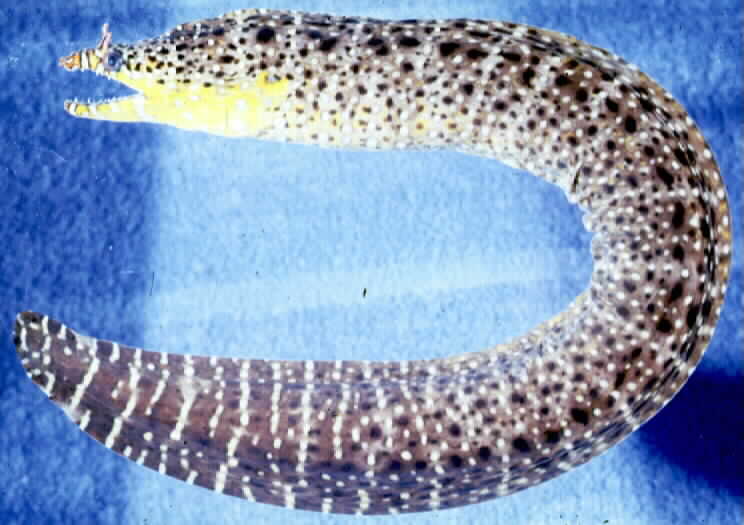 Dwarf moray, Gymnothorax robinsi Böhlke, 1997; this little eel was previously known from the Seychelles, Maldives, and Western Pacific Ocean. 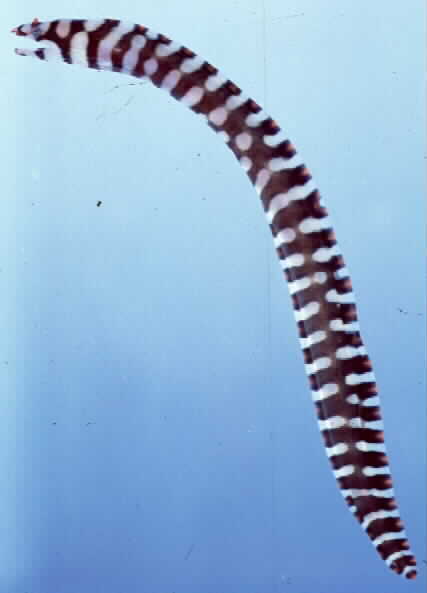 Females are mature at a length of 10 cm, and the largest known specimen is only 182 mm long. Uropterygius sp (new species?). Aliwal. This nondescript moray is interesting because we can’t match it with any of the known species in this genus. It probably represents a new (undescribed) species. Streaky clingfish, Lissonanchus lusheri Smith, 1966. This tiny (25 mm) clingfish tried to hitch a ride on Andy Bentley. 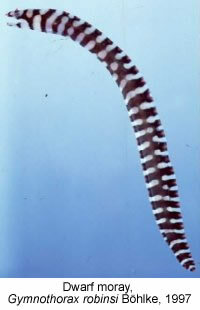 It was previously known from one specimen from Mozambique. We caught the Gulf damselfish, Pristotis obtusirostris Gunther, 1862, in our trammel net at Milibangalala; previously known from Persian Gulf and Oman. We found the white-spotted wrasse, Anampses melanurus Bleeker, 1857, at Park Rynie; it was previously known from Indonesia. The yellow-breasted wrasse, Anampses twistii Bleeker, 1856, was identifed by Sally and Dennis Polack at Sodwana; it was reported from the Maldives, Chagos, and Indonesia. The barred thicklip, Hemigymnus fasciatus (Bloch, 1792) and the ring wrasse, Hologymnosus annulatus (Lacepede, 1801) were seen at Sodwana Bay; previously reported from Maputo and Tanzania respectively. The beautiful and rare half-banded wrasse, Paracheilinus hemitaeniatus was photographed off Park Rynie by Dennis King. It has not been reported since the original description of specimens from Madagascar. The curious wormfish, Gunnelichthys curiosus Dawson, 1968, which we collected at Aliwal Shoal looks rather like a stubby eel or a stretched-out blenny with attitude, as it has a distinctly protruding lower jaw. Previously known from the Seychelles and Japan. Engyprosopon macrolepis Regan, 1908; collected at Sodwana. This little flounder was previously known from St Brandon Shoal north of Mauritius. The whitetail triggerfish, Sufflamen albicaudatum (Rüppell, 1829) was previously thought to be confined to the Red Sea, but we recently collected it at Aliwal Shoal. It is very similar to our halfmoon triggerfish, Sufflamen chrysopterum (Bloch & Schneider, 1801). Tyler’s toby, Canthigaster tyleri Allen & Randall, 1977; collected at Aliwal Shoal. Previously known from Mauritius. In addition to the exciting discoveries from our fish collecting efforts, we are also learning more about our fish fauna from the diver-members and underwater photographers who are playing an active role in the Project. Range extensions for many species are being provided by the divers and photographers. The financial support provided by Sappi to the Project was greatly increased this year, and this allows us to develop the fish survey work and produce more benefits to the members. The Fish-Watch method of using waterproof worksheets with colour paintings of the South African fishes to identify the species in our area is proving very effective as a teaching and learning strategy to help divers identify the various fishes of our diverse fish fauna. Once they can put a name on a fish, they can then talk about it, learn more about it, and get to know its habits. This increased knowledge provides a greater awareness and appreciation of our fascinating fish diversity.